This blog post is in recognition of the opening of a new exhibit at the Lambton Heritage Museum, Shine: Spotlight on Women of Lambton. This exhibit carries a special significance because the history of women is often forgotten or ignored. It's a rare chance to celebrate the women who have shaped Lambton County. Lambton Heritage Museums staff were able to pull some treasures from their collection to display in the new exhibit. One example is a dress from Helen Corey that tells a special story. Mrs. Corey lived in Petrolia and her husband worked in the oil industry. On display is a black dress that she purchased in Paris in 1926, along with the original receipt from the transaction. Receipt from Corey's dress purchase at Haton Soeurs in Paris, April 20, 1926. The receipt says "Robe tulle et paillettes noir" or "Black tulle and sequin dress." This dress was made for a night of dancing. The skirt is composed in several layers with a light top layer that floated while Helen danced and a stiffer layer underneath that swayed back and forth. The delicate beads along the neck are glass-blown beads. This delicate dress had deteriorated badly over time. Fortunately, part of the role of the Lambton Heritage Museum is to restore and bring back to life artifacts that would otherwise waste away. The dress was restored by a conservator in London who painstakingly sewed back on hundreds of the sequins that had fallen off over time. The conservator discovered that the sequins are made from a gelatinous or vegetable-based material and dissolve in hot water. If you look carefully at the underarms of this dress, you can see many of the sequins are partially dissolved or missing - Helen Corey must have enjoyed many nights of dancing and it cost her a few sequins! 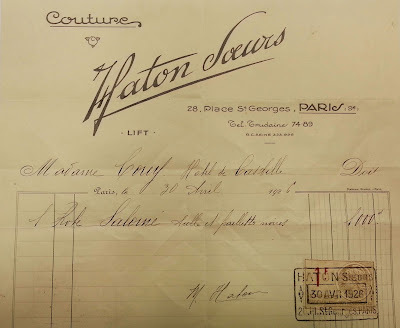 Through her restoration work on the dress, the conservator was able to uncover new and interesting information about Helen Corey and her dress. Visit the exhibit Shine: Spotlight on Women of Lambton at the Lambton Heritage Museum (10035 Museum Road - eight kilometers south of Grand Bend off Lakeshore Road) between May 12 and November of 2013 to see this and other interesting artifacts!